The NSCD works with groups of 2 – 15 volunteers to help fulfill their need for adventure and desire to serve! Youth groups, families, companies and more help meet the volunteer needs of the NSCD! Group Application: If you are the lead contact of a group interested in volunteering, please email the NSCD Volunteer Office at [email protected] or call (970) 726-1546 to discuss group volunteer opportunities. 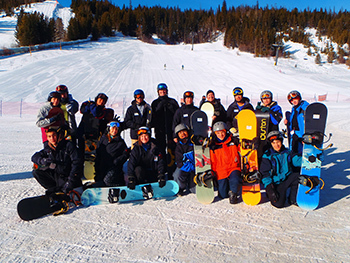 “We reached new heights with our NSCD athletes this week. Thank you NSCD for an amazing, perspective-changing week. You all do amazing work and we were lucky to be part of it!” – Nicole Mahobian, Group Leader for Colorado Young Leaders.